I don't know what you would say but I am at a point where I would have to scream simply "what the f*ck?!". There is no normal explanation for this. "Some people are mentally disturbed" no longer cuts it when 20 six and seven year olds are the chosen target. This is not just a tipping point for the USA, it is a question for the world, especially the virtual world. There is something that we are missing when we hear of teenagers doing these things. The only thing I can remember that is worse than what has happened in Connecticut, is what happened to poor James Bulger, a 2 year old in the UK, lured away from his Mum by two ten year olds to be t0rtured and murd3red slowly. Two ten years olds now in their 20s with hidden identities for their protection so they can live their lives in freedom. Huh!? What are we doing wrong? Are we too busy to notice we are raising psych0paths? Are we too lazy to keep them off video games that make murd3r seem like fun? What are we not teaching them about the value of life that they take it away from people so small and innocent and in no way capable of causing any form of pain to them, that would warrant these kind of vind!ctive and cowardly att@cks? And worst of all when we find out through some horrific situation that involves innocent people losing their happy existences, that these young people are actually psych0paths, why do we as a society find it necessary to protect them from normal people who feel that maybe it's not cool to have obvious s0ciopaths living freely in society? I am so mad, there is no way around it, I am furious. I am livid with his mother for teaching him to sh00t and having semi-@ut0matic weap0ns just hanging around, for knowing instinctively that he was not right and doing nothing about it. I am horrified that somehow a bunch of morons have lobbied to allow people to freely own these weap0ns. I am incensed that he and his mother* are gone so we can't make them live with the consequences of their choices or grab them and shake them until we find out why, Why, WHY????? Every beautiful smiling face I've seen on TV that I know now is no longer, looks like any of our family photos. The innocent unbridled joy of life still mostly unchallenged. I don't know what to say to those left behind without their beautiful little cheeky monkeys. There is no sense, nor hope I can find in this. It is a horror beyond any movie and over 40 people are not acting as they try to face something not even the most w@rped movie makers could think up. I suppose the only comfort is so many are grieving with you, not as deeply of course, but we are here too, feeling it hard and hating a world where this can happen. Something has to change, please, something has to come from these beautiful young things cut down so unfairly and far too soon. *One mother's account of living with a mentally ill son sheds new light on what this man may have been putting her through and raises great points about the potential root cause and its solution. There are no words. Most of us cannot understand or even begin to fathom that sort of evil. 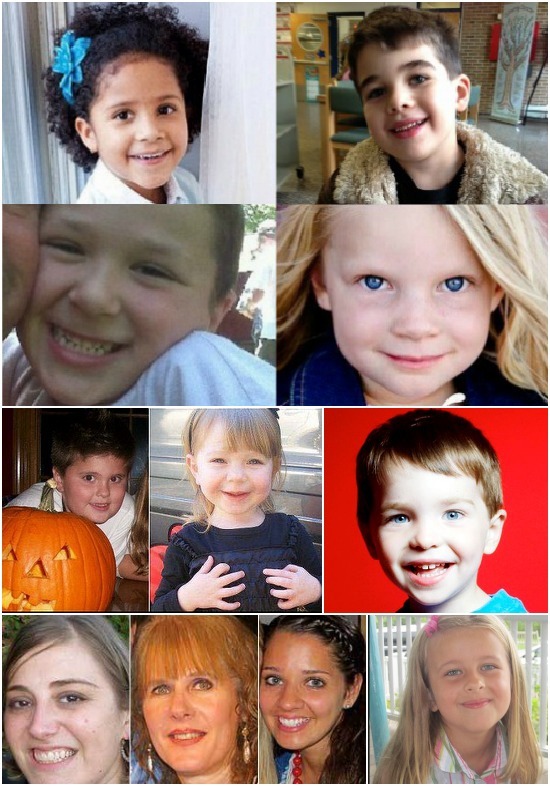 Every little face I see from those that were gunned down breaks my heart. They could be any of our babies. Thank God we don't live in the USA and I pray to God nothing like that ever happens here again. I thank God our politicians were brave enough to take a somewhat unpopular stand and ban certain guns. It may be a little late in the US but something is better than nothing. They have to try and prevent this happening so often. The statistics regarding gun related deaths are staggering and I hope 20 little coffins finally make someone stand up and take action. As a teacher, my heart also goes out to the teachers and staff of the school - those that survived and those that didn't - they all acted with such courage and selflessness and no doubt saved so many more children. 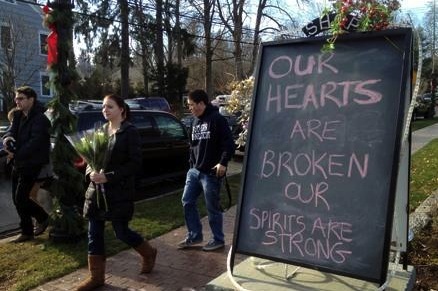 In their actions we saw complete good as opposed to the gunman's complete evil.